The Post Doctorate QC Scientist II will be responsible to develop, optimize and qualify methods for the functional evaluation of investigational products within the organization according to cGMP (current Good Manufacturing Practice) guidelines under the supervision of senior scientists in Quality Control. 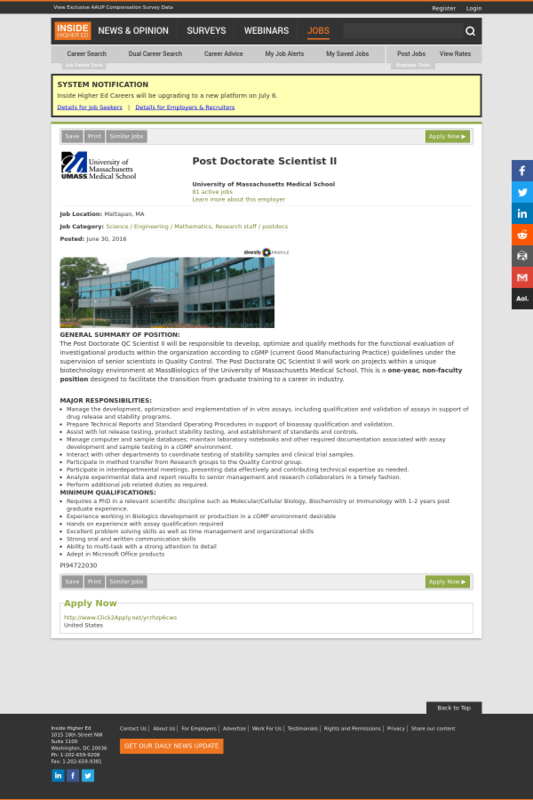 The Post Doctorate QC Scientist II will work on projects within a unique biotechnology environment at MassBiologics of the University of Massachusetts Medical School. This is a one-year, non-faculty position designed to facilitate the transition from graduate training to a career in industry. Manage the development, optimization and implementation of in vitro assays, including qualification and validation of assays in support of drug release and stability programs. Prepare Technical Reports and Standard Operating Procedures in support of bioassay qualification and validation. Assist with lot release testing, product stability testing, and establishment of standards and controls. Manage computer and sample databases; maintain laboratory notebooks and other required documentation associated with assay development and sample testing in a cGMP environment. Interact with other departments to coordinate testing of stability samples and clinical trial samples. Participate in method transfer from Research groups to the Quality Control group. Participate in interdepartmental meetings, presenting data effectively and contributing technical expertise as needed. Analyze experimental data and report results to senior management and research collaborators in a timely fashion. Requires a PhD in a relevant scientific discipline such as Molecular/Cellular Biology, Biochemistry or Immunology with 1-2 years post graduate experience.